TGIF: “George” — The Movie! In a world where unforgettable moments of well-earned defeat and humiliation in an iconic sitcom can be stripped of their context and re-edited to transform one of the most hapless and selfish of characters into the redeemed hero of a tearjerking melodrama — in only such a world could that hero be. . .George Constanza. This ingenious re-alignment of the Seinfeld universe brought to you by lorocker. This entry was posted in TGIF, Video on May 14, 2010 by Michael Happy. Thanks for this post on Sinatra, Mike. Frye’s erudite knowledge of classical music is well known, but the one essay he wrote on Frank Sinatra is a little known fact. It just goes to show Frye’s incredible range, like ol’ blue eyes himself. The essay remained unpublished; Sinatra threatened to sue, or worse–and you know what that means. And Sinatra. Just don’t get in his way. This entry was posted in Hijinx on May 14, 2010 by Joseph Adamson. 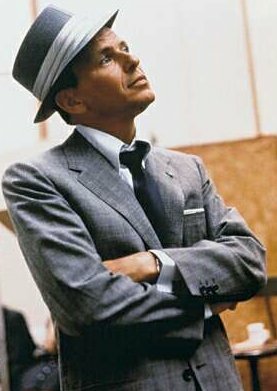 On this date Frank Sinatra died (1915 -1998). Above, “I’ve Got You Under My Skin”. This entry was posted in Anniversaries, Video on May 14, 2010 by Michael Happy. Parts of this post come from my introduction to Eva-Lynn Jagoe’s plenary lecture – The Linda Hutcheon and J. Edward Chamberlin Lecture in Literary Theory – at the annual conference at the Centre for Comparative Literature. Most readers of this blog will likely have never encountered Eva-Lynn Jagoe, the author (currently at work on “the long novel”) or the professor, so let me briefly indulge here in giving some account of her as instructor. In the classroom, Professor Jagoe’s central goal is always to test ideas and question students and their ideas. Her classroom is a laboratory for readers. The first thing to know is that Eva-Lynn often seeks to break down the institutional walls of the structure: we ultimately tossed the syllabus. In its place, each student agreed to offer commentary, work through Proust, and decide with Professor Jagoe (I’m oscillating between the professorial and the personal precisely because blurring of lines is so important, and to show that students ultimately did recognise there was a professor in the room) how we would be evaluated – but evaluation, as a university requirement, takes on a new role in her classroom. Throughout the course on Proust, we experimented with a new pedagogy and a new classroom experience (or, perhaps, just new to me, but something felt novel). The classroom always has food, always has drinks, always had laughter: these were the requirements. 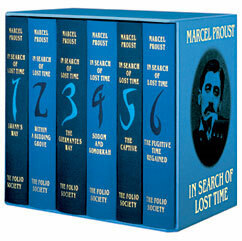 Additionally, we were to read and discuss the novel from personal, subjective, and confessional starting points – which, naturally, makes Proust the near perfect subject of study. It is in this space that we, students and professor, began to experiment with modes of teaching, modes of learning, modes of reading. This entry was posted in Education on May 14, 2010 by Jonathan Allan.